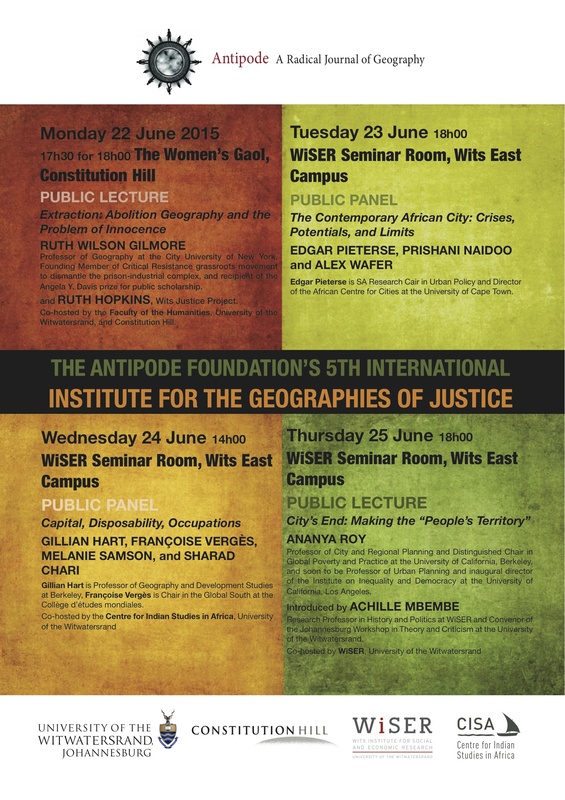 The Antipode Foundation's 5th Institute for Geographies of Justice (IGJ), a meeting of radical-geographic practitioners, comes to South Africa for the first time from 21-25 June 2015. Building on its robust intellectual engagement, the 2015 IGJ programme tackles topics such as: dis/possession and occupation; difference/differentiation; desire, affect, materiality; value, values, waste; space, territoriality and nature; urban formations and spatial justice; knowledge, discourse and power, and the praxis of radical geography. The Wits Faculty of Humanities is proud to be a partner of this event where eminent scholars and activists will engage critically with theoretical, methodological, and activist issues in the fields of radical geography and social justice. A public lecture by Ruth Wilson Gilmore (Professor of Geography at the City University of New York) and a response from Ruth Hopkins (Wits Justice Project). Themba Ntuli, Acting CEO of the Constitution Hill will deliver the opening remarks. This lecture examines the gendered role of mass criminalisation and incarceration in the everyday life of contemporary racial capitalism, demonstrating how and why – on both conceptual and practical levels – extraction links gold and prisons. Venue: Constitution Hill, 1 Kotze St, Johannesburg. A public discussion with Professor Edgar Pieterse (SA Research Chair in Urban Policy and Director of the African Centre for Cities at UCT) in conversation with Dr Prishani Naidoo (Sociology Department, Wits) and Dr Alex Wafer (Department of Geography, Wits). A conversation between Professor Françoise Vergés (Chair in the Global South at the Collège d’études mondiale) Dr Melanie Samson (Department of Geography, Wits), Professor Sharad Chari (Centre for Indian Studies, Wits) and Professor Gillian Hart (Geography and Development Studies, Berkeley). A public lecture by Professor Ananya Roy (Distinguished Chair in Global Poverty and Practice, University of California) introduced by Achille Mbembe (Professor of Politics and History at Wiser, Wits).